KP Oli, Nepal’s new Prime Minister, has always been one of the biggest detractors of the Maoists. He despised the Maoists and the UCPN (M) dubbed him a ‘mentally sick’ person only one year ago. But Oli and the UCPN (M) Chair Pushpa Kamal Dahal have once again proved that there are no permanent friends or foes in politics. 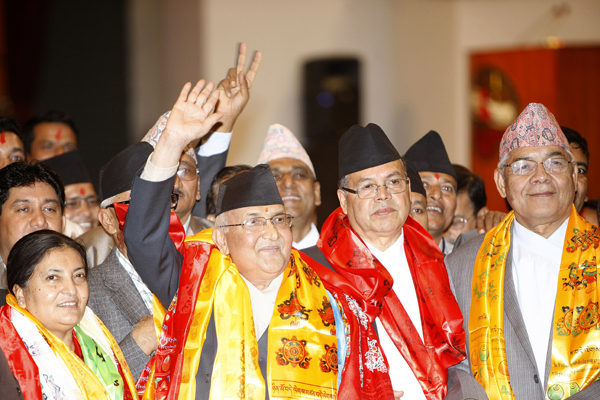 On Sunday, Dahal’s party voted for Oli to become Nepal’s 38th Prime Minister. During the war, Oli always attacked the Maoists with his razor-sharp remarks cleverly using colloquial proverbs to create the fitting context. He did not look pleased even when the Maoists joined the peace process and surrendered arms. But Oli himself started his political career with a bloody class struggle. He was one of those radical communists who beheaded people terming them as their ‘class enemy’. Born as a poor Brahmin in a Limbu-dominated village of Terhathum, Oli grew up in Jhapa district that shares its border with West Bengal, India. This was 1960s, and Charu Majumdar, a Bengali communist, was fighting an anti-state war in a nondescript West Bengal village of Naxalbari to create a class-less society. Flames of Charu’s struggle, which later turned into a protracted Naxalite movement, quickly spread to Jhapa, and some Nepali youths took up arms to eliminate landlords and create a class-less society. Oli, Radha Krishna Mainali and CP Mainali led a bloody insurgency in which eight landlords were beheaded in Jhapa. A series of murders of landlords, known as a Jhapa revolt in Nepal’s communist history, shook the Panchayat government, and police killed five communists in the Jungle of Sukhani in Jhapa. Oli survived the state killing but was arrested. He was released shortly but again arrested and charged with treason. As an ‘anti-national’ element, he spent 14 consecutive years in jail until 1987. After restoration of multi-party democracy in 1990, Oli emerged as a national-level leader but did not get a chance to lead the government for 25 years. Even in his party, he was just one of the senior most leaders. In the first Constituent Assembly elections, Oli faced a humiliating defeat at the hands of a little known local Maoist leader in his own home district. Many thought that was the end of Oli’s long political journey. But Oli soon consolidated his position within the party, earned chairmanship and became parliamentary party leader, projecting himself as a future prime minister. He prodded the NC and the UCPN (M) into promulgating the constitution because he was in a hurry to become Prime Minister. Oli is said to be not as hard-working as UML leader Madhav Nepal. He does not have the image of a gentleman like other UML leader Jhal Nath Khanal. But he is clever, outspoken and is good at close-door negotiations. After becoming UML Chair, he has proved that he is a good organiser, too. For Oli, the road ahead is bumpy. He has become Prime Minister at a very difficult time. His success will be determined by how openheartedly he reaches out to Madhesi, Tharu and Janajati dissenters, how quickly he mends Kathmandu’s relations with New Delhi and how smoothly his government implements the new constitution. On top of all that, he will also have to focus equally on post-earthquake reconstruction. Great achievement for Nepal. It becomes only the second country in the world after IS to ruled by terrorists. Doomsday ahead for North Nepal and South Madhesh. It would now be the most appropriate time in the history to have separate country for dhotis free from the terror of yet to tried terrorists in international courts. happy that gachchadar is back! Strange, only fools make one sided opinion and live in Utopia, read about the American Revolution, remember Gettysburg incidence where blacks were murdered, remember Boers war, remember Nalapani where enlightened Britishers blocked the drinking water and Nepal lost. Do not look one side only, you have a luxury to elucidate your little one-sided knowledge in-front of once savage western world and tell the world that “look a IS like person is ruling Nepal “. My son you do not know, how IS is created, the most powerful machinery in the world destroyed a nation called Iraq on a false pretext that it is making weapons of mass destruction. People like you who only read New York Times and Herald Tribune and make your opinion out of Prashant Jha’s book will always say such things but remember only good win otherwise IS like in-humans could rule the world whom many anarchist are willfully waiting.